I was fortunate to obtain an early release of GQ's newest version of the 500+ GM meter - the GMC-500+V2. GQ has not only been listening and participating in the discussion about this meter here, but in the six weeks I've owned my 500+, has made numerous changes to firmware, and gone to great lengths to help us understand the circuitry and other aspects of the hardware. The GMC-500+ is unique among commercial offerings, sporting two GM tubes of different sensitivities. It can handle background measurements and low levels of beta and gamma radiation with the more sensitive M4011 GM tube (~.1 uSv/h to 275 uSv/h), and then incident level response with a much lower sensitivity SI3BG GM tube (~100 uSv/h to 42,500 uSv/hr). Comparing with US CD-V meters, this one instrument replaces my CD-V 700 GM meter and the lower end of my CD-V 717 IC (Ion Chamber) meter. As the 500+ has gone through evaluation on this forum, users have identified some limitations. Once these were better understood, GQ modified the firmware to add flexibility for user adjustment of how the two GM tubes interact, greatly improving the utility of the meter. Still, there were some hardware changes that were needed as well. With the release of the GMC-500+V2, two more limitations of the GMC-500+ have been eliminated or improved. And there is now an added component of DIY in the build. Here are my two 500 meters. At the top labelled GMC-500 is my first 500+. Lower right labelled GMC-500+ is the GMC-500+V2. One hardware limitation of the 500+ is that both GM tubes are connected in parallel to the HV power supply. This allows response of the higher sensitivity tube to affect the response of the lower sensitivity tube. The 500+V2 eliminates that issue with a separate power supply for each tube. Here is a picture of the PCB boards with 500+ at top and 500+V2 underneath. The twin power supply sections are obvious in upper and lower left corners of the lower PCB board. The larger black components are an inductance coil for each. Missing from the 500+V2 is the pot controlling the HV voltage level to the tubes (silver component just below the upper large black component in the upper left corner of the upper PCB board). The voltage of each power supply is now controlled by firmware with new menu selections under Init Setup at the first menu level. Previously at the first level under Init Setup, tube selection, display and calibration items were under the Calibration menu. In the V2 there is now an additional selection titled Tube Settings. Calibrate now only has the three calibration points to set. Choosing Tube Settings gives access to Selection, Display and the ability to set the voltage for each tube. When you select Tube1 or Tube2 Voltage you get a popup window with the percentage of the power supply's output. It goes away pretty fast if you don't change it but you can increase or decrease by unit count. The meter arrived with both power supplies set to 22 (22%). At these levels the power supplies each measure 392 VDC. I haven't yet tested how much change each unit increase provides, but will be one of the first things I measure when I next get some time. That covers the first aspect of the existing hardware we were concerned about. The other was current draw and voltage drop with increased counts of most sensitive tube first and its effects on voltage at least sensitive tube. Given that we now control voltage of both power supplies with firmware (manually at present with menu adjustment of percentage), later adds to firmware may be able to adjust power supply voltage automatically as the tube draws it down due to count loading. We can also set voltage of most sensitive GM tube to 0%, effectively turning it off. Again something we've discussed as a requirement of fully utilizing each tube across its plateau area of response. And one more optional plus to the V2. The new PCB has room to augment the primary tube power supply (M4011). Four user installed components can be added to double the current the power supply can provide. In the upper left corner of the PCB there is a parallel branch missing these components. Above the larger black component is a second spot for another inductor. The other components have already been added to this PCB (resistor, diode and a transistor as surface mount devices). When the inductor is in place the current the power supply to the primary M4011 tube is doubled. We have a lot to evaluate anew. And I for one am once again pretty amazed at how an electronics company can be this responsive to user feedback. I remain committed to the belief that they intend these series of GM meters to set the standard by which other will be measured. Again, jealous that you already got the fixed hardware (you lucky US guys!). I will be waiting for my device still for some time, and hopefully I will be able to test it as well. The hardware specs that you comment look really good! It seems that GQ has been listening to us carefully during these last months, and I applaud that. Clearly this device could now fulfill the advertised specifications. 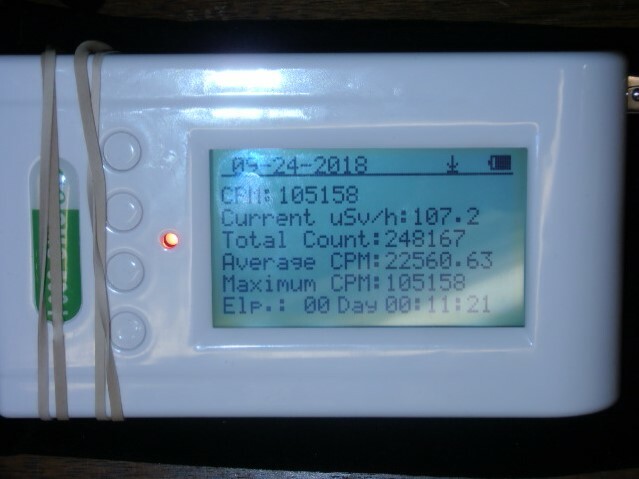 I�ll hopefully see more details soon, but while I am waiting, could you check with your Cs-137 source what is the voltage drop of both HV circuits when the M4011 is being driven at high CPM? Could you check if the voltage actually disappears from the selected circuit if you select 0%? I do believe that if the new V2 hardware works as expected, the GMC-500+ will become a unique GM counter among the low cost devices! And I love the �GQ GMC-500+� label, which was missing in the original 500+. P.S. The �Tube settings� menu is also in the GMC-500+, firmware 1.23 (obviously, the tube voltage submenus are missing). I believe I need to get 1.23 added into the first 500+. Then they will be similar at that menu level. I first will be checking the voltage adjustment sensitivity. What do I get when I change things by one unit, five units, ten units, etc. It is very encouraging that with both settings at 22 (22%) the voltage is exactly the same at 392VDC. Then I will see what the reading is at 0 (0%). GQ has already told me that it may not be exactly 0VDC, but likely close. Then I want to stress the M4011 circuit with counts and see if the voltage changes at the SI3BG supply. Finally if I can rig it with two DMMs I want to see how both supplies handle significant counts. There likely is a 10 uCi Cs137 source that would help make that work that I am looking at acquiring as well. With the 10 uCi source under the SI3BG and the 5uCi source under the M4011, it should be interesting. Finally I want to add in the last component of the power supply augmentation (inductor) and redo stress tests of signicant counts on the M4011 tube, redoing voltages. Since the PS inductors have ~5% value tolerance, so the final voltage may have about 5% difference even it been set on same value. The voltage adjustment is from 0 to 100. But it is not linear on voltage change. Your tests look good to me! Looking forward to seeing the results! Anyway, it is not needed 0 V to disable the tubes. Anything way below the plateau will effectively turn them off (it can be tested in the old 500+ with the variable resistor). About the additional inductor to increase the power, how do you know that it can be added transparently to the circuit? Do you have GQ's information about the design? If only an additional inductor was required to have more power capability, why it is not already included from factory? Maybe it is not completely tested or they decided to leave the gap for a future PCB revision. There are four components required to augment the power supply. GQ meant it for a DIY project, and I think it would only be added by advanced users. When documentation is available a list with specs will be provided and I assume the user can acquire (<$5USD). Three are surface mount (resistor, diode and transistor). The inductor is hole through and solder. I had GQ install my surface mount components as I don't have proper tools to do so. The inductor I can mount fine. And without it the power supply isn't augmented. I wanted to test voltage stability of the two power supplies as they come out of the box and then measure the benefit of the added current availability to the primary. That DIY PS is a copy of main HV PS. The output is directly connected to the main PS output. Four components need to be soldered: an 15mH inductor,a 1K resistor, a >700V NPN transistor and a fast recovery >700V diode. This DIY work basically is only for advanced users who really want to increase the PS current and know what to do. All GQ Geiger Counters provide a chance to user to DIY, to expend the capability of unit. I did not know about the DIY aspect of GQ products. There is an expansion connector in the original GMC-500+, but I never found any information on how to use it (by the way, it does not seem to be there in the new V2 PCB). It would be nice if some documentation is released with the circuit details and several advanced user options. From the pictures, it seems that the DIY PS (the capability to double its power) only affects the M4011 tube, which makes sense anyway. The best solution for that is to buy several inductors and measure them, using the most similar ones in the same PCB. Obviously not easy for mass production, but easy for DIY. The power supply looks to be limited to 600 VDC. Since I want to minimize any voltage drop effects from counts I left voltage for Tube1 at 26 (26%) which provides 440 VDC, at the top of the plateau for M4011. Should make the comparisons of the Tube 1 measures equal between the two meters. With same size of inductor, higher the inductance will increase the output voltage, but lower the current. Thanks ZLM! That is good to know. I think all the working ranges of the alpha detectors LND 7313, 712 are around 450VDC with top end of 600VDC so we should be good. (I noticed the PCB said 500+, 600+. I have noticed that I miss watching directly on the screen which tube is being used for the readings, without having to move between menus and submenus to check. I propose that you add a small icon to the top right corner indicating the number 1 or HS (as for High Sensitivity) when tube 1 is being used, the number 2 or LS (as for Low Sensitivity) when tube 2 is being used, and the text/icon AUTO when both tube readings are being used automatically. This is applicable to both versions of the GMC-500+, although the AUTO mode is useless in the old 500+ version and will never work properly due to the insufficient HV power. In V2 version the AUTO mode could work as expected if the power is enough to drive the tube 1 at its maximum count rate while the tube 2 is still on the linear response curve. Here the correction for the dead time counts could make sense again, as tubes are limited by their response time to an asymptotic maximum count rate equal to the inverse of the recovery time (e.g. 1/200�s = 5000 CPS = 300 kCPM), or just to simplify the definition of the tube characteristics in the menus. In any case, I think that the combination (or AUTO) algorithm needs to be reworked bearing in mind the new capabilities/requirements. I know that is not easy, because both tubes behave differently to different types of radiation (the ratio of sensitivities between tube 1 and 2 for beta is not equal to the ratio of sensitivities between tube 1 and 2 for gamma/xrays), but my proposal is that you forget about beta radiation and focus on gamma/xrays, as it is the mainly existing radiation when you are measuring a location (not a local source) from a reasonable distance here on earth (unless there are isotopes floating in the air shortly after a nuclear explosion!). Well, the last is not totally true, as you could also have neutron radiation, but you cannot measure it with the GM tube anyway. Stargazer_40 could check how the new V2 hardware is performing in that sense (I don�t know if GQ has already made any changes), and if the firmware is still adding both tube counts in the AUTO mode. 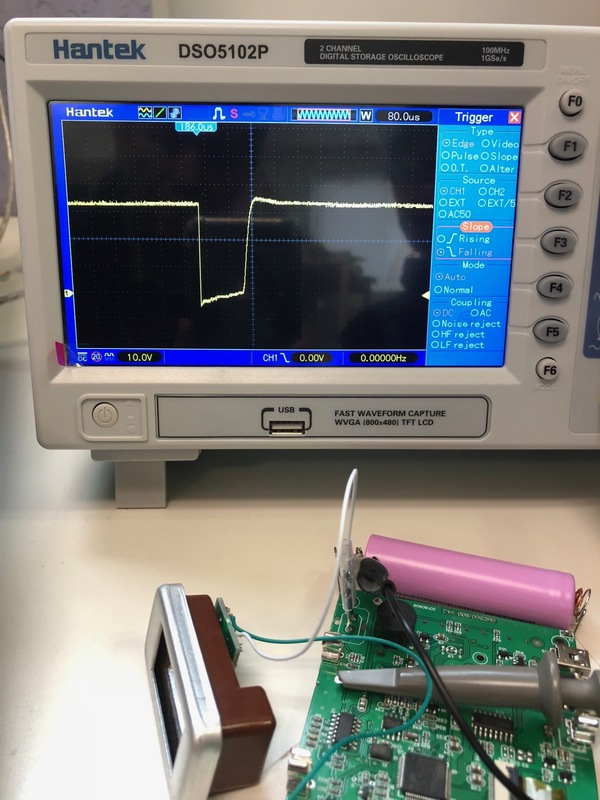 The second picture shows the screen still with the Cs 137 5 uCi source against the M4011 tube but also showing the voltage of the anode cathode measure of the SI3BG tube voltage while the M4011 tube at same high CPM. Reading of tube 2 voltage didn't change at all with high counts of tube 1 and is still as set at GQ prior to shipping (394 VDC). Next image is now showing measure of counts after attaching clips to anode and cathode of M4011. (Both tube voltage measurements were without the anode resistor included.) The voltage of the M4011 tube had been increased to 435 VDC by raising voltage percentage of tube 1 to 26 from 22. CPM are down from slightly different position of source, but still over 85,000. Voltage of tube 1 has dropped below starting voltage to 342 VDC. So one of two things has happened. Tube 1 voltage has been pulled down to a point where we are out of the plateau region (for sure) and simply accepting counts as the PS recovers (although still a very high rate), or we might still be reading max counts and this tube might still be functioning well in the plateau region, but we're not getting true voltage because our DMM is not sampling adequately. Probably could tell by building a stand and bring source closer step by step. Down the road maybe. These power supplies appear completely independent so far, with high counts on tube 1 not affecting voltage at tube 2.
while CPM is high to check if cpm increases or stays the same. When you get your measurements using the DMM, are you correcting for the effect of the multimeter+1GOhm impedance in parallel with the tube? If you don�t, then you cannot know the exact voltage. For example, if your DMM reads 3.809 V, the actual voltage in the tube when the DMM is connected will be 101*3.809=384.709 V (10 MOhm DMM with 1GOhm resistor). But the tube will be under higher voltage when you disconnect the DMM, and that depends on the internal (output) impedance of the HV circuit. For 16.12 MOhm (shown in ullix�s circuit), 384.709 V will become 392 V when the DMM is not connected (and the tube is not counting or is counting at low CPM). That could also be the reason why your M4011 reduces the CPM when the DMM is connected to the tube terminals (not because of the source), as you are increasing the current consumption with the DMM in parallel and the HV PS cannot provide enough power. When you measure the HV system you change the system (like the Heisenberg's uncertainty principle). If you are measuring around 100 kCPM and not the ullix�s predicted 60 kCPM is probably because the HV circuit of the 500+V2 can deliver more current (is more powerful) than the original 500+. Effectively, that would mean that its internal impedance is lower. Ullix, where did you find the internal impedance of 16.12 MOhm for the HV PS of the 500+? To be fair, I haven�t looked into the PCB. Instead of adjusting while high counts (difficult when device is apart), I set the tube 1 voltage to 550VDC (40%, and Limit Working Voltage of M4011 is 600VDC so okay) and then set the source underneath the center of the M4011 tube. The voltage fell immediately to between 350 and 357 while counting up, so below plateau start of 360VDC (but remained at or above max starting voltage of 350VDC). Placement of center of source and center of tube critical for highest counts it appears. Got over 105,000 CPM (so if meter affecting things not a lot). Then a pic of the tube 1's voltage and screen of meter with source. So with this 100,000CPM source, we need a starting voltage of 550VDC to be able to stay at or above the Max Starting Voltage of 350DCV. I think if we can start at 400 VDC (middle of plateau - Tube1 Voltage - 22) and raise voltage when it drops below middle of plateau (400 VDC) using whatever percentage it takes to keep it above 400 VDC with firmware (Auto Voltage Adjust - On/Off and Auto Voltage Trigger Level Percentage - 22 and Auto Voltage Upper Limit Percentage - 75) we would have a very flexible meter. Oh, and I haven't added the inductor yet to enable the augmented power supply. Very interested in what that does to voltage drop. Now I want to go back and read the dead counts discussion. My point is that when you measure 355 V, it is actually going to be more than 355V when you disconnect the DMM. To check that behaviour, try to set up your test again where you were getting 85,000 CPM with 342 V. Then disconnect the DMM from the tube terminals and see if the CPM increase or not. I guess that they will. 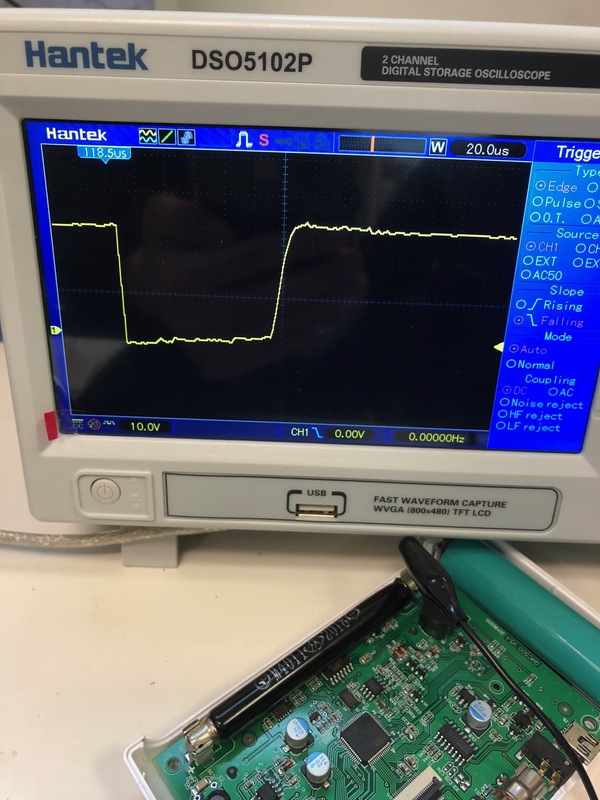 In your last test you increased the starting voltage so much that it was able to compensate for the big voltage drop and keep the tube in the plateau even with the DMM connected. That is why you got your 100 kCPM again. I agree with you idea of automatically regulating the voltage by firmware to keep the tube in the plateau. 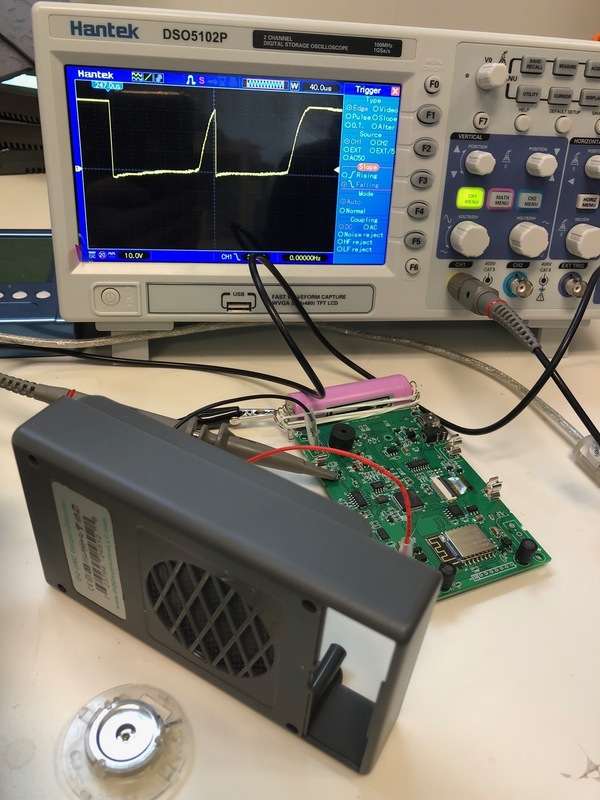 But, again, be careful with the DMM measurements as they are not telling you the actual working voltage when the tube is not connected to the DMM. On the other hand, at this high CPM count rates, the error due to the missed counts (tube recovery time) in the tube is enormous! Ullix, where did you find the internal impedance of 16.12 MOhm for the HV PS of the 500+? To be fair, I haven�t looked into the PCB. What do you mean with "where"? The internal impedance Ri does not exist as a physical device you can put your fingers on, and neither does the voltage source Ui exist. They are determined by describing the HV generator with an "Equivalent Circuit" ( e.g. https://www.chegg.com/homework-help/definitions/equivalent-circuit-analysis-4 ). Just look into http://www.gqelectronicsllc.com/forum/topic.asp?TOPIC_ID=5369 my Reply #15. Take the two measurements and write down the Ohm's equations U=R*I for the two situations, and solve for Ui and Ri. It gives you an approximation for the true, more complex situation, because you are implicitly assuming linearity, which likely is not the case. Nevertheless, Ri will likely be in the order of 10...20MOhm (low is better), and Ui will be rather close to 10V higher than what you measure via 1 GOhm. Just apply Ohm's law; it is straight forward. Thanks ullix for a number for the effect the meter is masking as to voltage. 10 volt add gets us into the published plateau region for the M4011 tube. ikerrg, it is difficult to access buttons with things apart and difficult to deal with power when PCB and battery are out of top of case, so I think we take ullix's 10 volts and call it good for necessary add. And I think now we do need to deal with dead counts in calculations. So probably need to go back to that thread (ullix's review of his 500+) and figure out how to bring that into play. It is nice that we can likely do all this in firmware. If we follow the flow of an auto voltage compensation, what has been described so far will raise it as the voltage falls. We also need to lower it after the source is removed and the voltage starts to climb. In the region near mid plateau each percentage point change increases or decreases about 10 volts. So if voltage is greater than +/- 10 volts from 22% (21% if we add back in the 10 volt meter effect) then the auto voltage adjustment needs to work both ways to bring back into middle of plateau voltage. Since by PS design we are unlikely to exceed 600 VDC I don't think we will ever endanger the GM tube since that is the published voltage limit, but neither can we leave it there as well out of plateau range. So I have reviewed the dead time calculation and see that if dead time is 200 usec (as ikerrg suggests) then we are looking at 20 sec of dead time for 100k CPM. So 100k/(1-(20/60)) = 100k/(1-.33) = 100k/.67 = ~150k CPM actual. However, if 100 usec, then we get 100k/.83 = ~120k CPM actual. Do we have any idea what the actual dead time is for this M4011 tube (and the SI3BG tube for that matter)? One place I read says 100 usec dead time is average. But perhaps we would need to make dead time a user supplied variable in any correction. But perhaps we would need to make dead time a user supplied variable in any correction. Bingo! That was my proposal some months ago. And that could also simplify the nonsense 3 point "callibration" system used in GQ's devices (although "callibration" here does only mean "guess the uSv/h from the CPM"). @ullix. I know what are you talking about, and that is called the Thevenin equivalence. Maybe you prefer to read this https://en.wikipedia.org/wiki/Th%C3%A9venin%27s_theorem , instead of a homework-helping web. But I was interested in where (or, sorry for the wrong word, how) did you find/get that in the HV circuit of the 500+. I know nothing about the circuit apart from what you showed in http://www.gqelectronicsllc.com/forum/topic.asp?TOPIC_ID=5369, and maybe you had additional information. And in any case, I am no expert in electronics at all to be able to take that from the PCB. And bearing in mind the tolerance uncertainty of the 1 GOhm resistor, it looks difficult to get a good precision using Ohm's law. I've also been thinking about how this auto voltage thing will work. The meter doesn't know what voltage the power supply is at. It only knows the percentage of power supply voltage to apply to tube. It does know CPS of the tube and likely we would base adjustment on voltage loss or gain as counts change due to proximity of source. GQ, is that your concept of auto ranging voltage adjustment? Good point! If the device does not have access to the delivered voltage or current, we can only estimate the regulation based on the CPM (better CPS?) being measured and the tube known data (different for the M4011, the LDN..., etc). That would be another callibration (this time it is an actual callibration) so a specific tube with the specific HV circuit will be always inside the plateau voltage for different CPM readings. That would make things very complex, I suppose. I see some form of if-then-else. Still an auto voltage adjust on off so user could set voltage for DYI projects, but if auto is on, then if CPS is below some number voltage is as set by tube1 voltage percentage. If CPS greater than that number then increase percentage by different amounts for different CPS for as you said calibration results. Might be linear enough to only need a couple of calibration entries (slope and intercept). Compared with the source counts I got with the M4011 tube in the same configuration (105,000CPM) there is a difference of 214 times. So for both betas and gammas coming off the source I see a conversion factor of 214 * .0065 = 1.391. Entered into the 25 count calibration point 3 would be 34.775 and this is about half the sensitivity I have gotten before with gas lantern mantles (15.85) and about one seventh the sensitivity of GQ's .195 conversion factor for the SI3BG tube. While I think a better number than anything I've come up with so far, it doesn't really mean much as I think I really need to separate out all the beta noise as ullix has said on numerous occasions. The thin lead plates on either side of the source will likely allow that as we have seen again in post #21 of ullix's 500+ review. That will be next experiement. I think you should always use the "Large text" screen with the corresponding option activated to see the CPM of both tubes at once. If you take a picture to that screen, then you will be able to see later if the other tube was measuring counts and what number, to see if the results could be cross-talking. This is not so important for the 500+ V2, I suppose, as the cross-talk is small or non-existing. I agree, as I had the original meter a couple inches away on tube 1 and it was adding between 100 and 200CPM from the proximity to the source. Nice to be able to turn off the M4011 in the V2! Read carefully and note the impact of capacitance! Not mentioned there is the impact on the Poisson distribution; make sure you look at that carefully. Very important! I finally received my new device and I will start testing it as soon as I find some spare time. Stargazer_40 has already gone through a good battery of tests, so I do not want to repeat those, and in any case, I do not have the radioactive sources to drive the tubes to such high CPM counts. So, for the time being, I will try to find other problems (firmware bugs, inconsistencies, improvements, etc.). I already noticed a few minor tolerance issues in the manufacturing of the unit that I reported to the technical support. I am still waiting for the opportunity to go to a high radiation area in my work place. That would be mainly gamma radiation and in a big volume (i.e. about homogenous), so very useful to finally find the ratio of sensitivities between the two tubes. 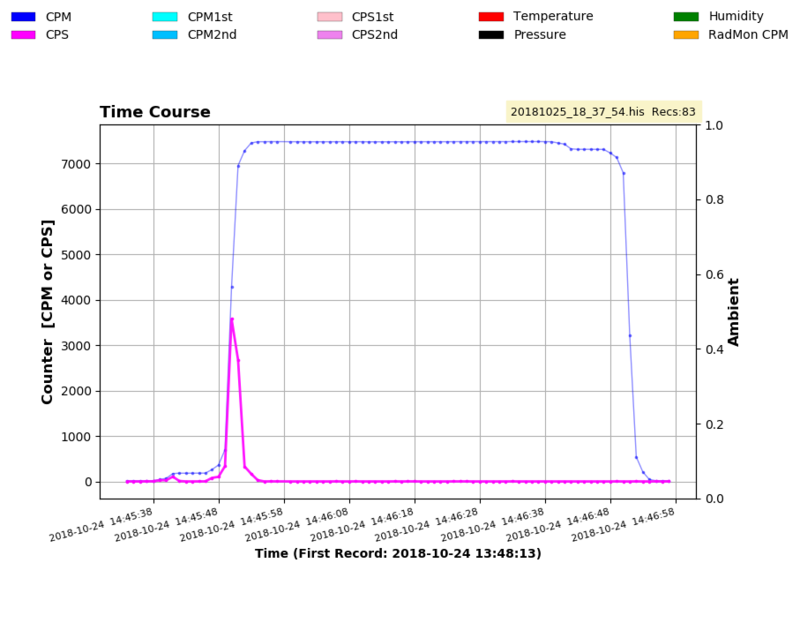 And as Stargazer_40 confirmed, the new version is not limited by the parallel connection of two very different sensitivity tubes, and therefore I see this new GMC-500+ as a really capable and promising device! Nice to be able to turn off the M4011 in the V2! I think it can be done easier than changing the tube voltage in the voltage percentage menu. I noticed that the counts of the tube 1 (in the �Large text� screen) go to 0 when you select only the �Tube 2� in the menu. That didn�t happen in the original 500+, so I assume that the firmware is automatically turning off the voltage of the tube not being selected by the user. I will confirm that this night when I can find time to do some voltage measurements. That is something that I requested some time ago to save the tube�s lifetime, especially when you activate only tube 2 and you want to do high radiation measurements (saving M4011 life). I am happily surprised on how GQ has been listening to us these months and has implemented so many fixes to this new release of the 500+. @EmfDev: Please, check my previous reply#11 in this thread for a firmware improvement. I think that a small icon at the top right corner would be very helpful to quickly identify in which mode the device is working (Tube1/HS, Tube 2/LS or Auto). I have added the inductor to the tube 1 augmenting power supply, turning it on. With comments made about a 10 volt increase for 1GOhm meter effect, I believe my measurements so far show that the 500+ with the second tube1 power supply added in and voltage set at the upper end of the plateau (440VDC) supports the 5uCi source (properly placed) in the plateau region of M4011 voltage. This makes the DIY component adds a good thing if you want to make use of the M4011 tube independently of the SI3BG tube. That said, if you're wanting to use the pair of tubes in tandom (as originally designed), then the power supply as we have said through all ullix's work and some of what I've presented shows that 30,000CPM (crossover point for tube1 to tube2) can be supported by the independent power supplies of the V2 as shipped. We still have to work with conversion factors though and ikerrg's access to some high gamma counts is very much welcome. I will show the data from the meters when I resolve a better voltage out terminal structure. The V2 meters don't have that handy capacitor PCB hole that I was able to solder a wire to on the tube1 power supply of the original 500+ that I have, so I have to clip to the tube clips and that is fraught with mechanical instability at this point. @ikerrg we will try to see where we can put that icon because the top right of the screen is kind of full. Looking forward to seeing the final voltages and pictures! So it seems that the additional inductor is actually needed to keep the voltage of the M4011 tube when measuring 100 kCPM? Could you tell the inductor characteristics? and then the dose rate in uSv/h is straightforward by multiplying the CombinedCPM*tube1sensitivity (the famous 0.0065). @EmfDev: What are your thoughts about that? I did an Excel spreadsheet some time ago to prove the algorithm, I can review it now that the hardware is capable of driving both tubes. On the other hand, I am getting these voltages with the DMM connected. So, much lower voltages that your device, Stargazer_40. There is the uncertainty of the 1GOhm tolerance and the DMM internal impedance, but it seems too much of a difference! And by the way, I can confirm that the voltage of the non-selected tube is close to 0, so it seems that the 500+V2 is turning off the tube that is not measuring! Well done, GQ! Another comment that I forgot in the previous post. The new device has a hole on the PCB where the antenna of the WiFi module is located. I suppose that it is to avoid the RF shielding of the copper layer on the PCB. However, it would have had the same result if you had etched the copper on the surface beneath the antenna, as the PCB is just fiberglass and resin that it is totally transparent to the RF waves. I suppose that the PCB would have been a bit cheaper without that hole cut in the middle. We are going to look into changing the CPM. As for the voltage, you can use a normal multimeter to measure it. With a 10M-ohm multimeter, the reading should be around 150V. To check if your device has actually lower voltage. The hole is there so that we don't worry anymore for any interferences. It might have worked same as without hole. One of each RH1/RH2 and RH3/RH4 pair is 0 for flexibility. You can change it to anything when necessary. Also, when a tube is turned off or (0%) there should be ~3V between the terminals because of the power supply. So I have finally updated the Excel spreadsheet with the calculations that I would put into a Geiger counter firmware if it was mine (https://www.dropbox.com/s/95fs62jb2hc0n85/TubeCombination_v2.xlsx?dl=0 ). Please, take some time to analyse the inputs and outputs of the algorithm, which is based on the current statistical algorithm previously proposed by ullix. As for the inputs (the dark green cells), only the calibration and the dead times are required for each tube (4 numbers). The light green cells are only the external actual radiation inputs. Everything else is calculated from those 4 numbers (that are now just a guess) and the measured counts of the tubes. You can see the limits of the tube 1 above 100 kCPM, and therefore I discourage the use of it above that radiation. From there on, tube 2 or the combination algorithm should be used (see the calculations in the spreadsheet). You can also see the measurement error between using corrected vs. uncorrected CPM values. The three tables show how it would be the measurement using only tube 1, only tube 2 or the combination algorithm, both with and without the dead time correction. You should also add the possibility for the user to activate or deactivate the dead time correction; it is extremely easy for the algorithm. And remember that the combination algorithm is only useful if the radiation is homogeneous enough to be equally affecting both tubes (like in the current firmware). For inhomogeneous fields (small sources), tube 1 or tube 2 measurements are required (like in the current firmware). 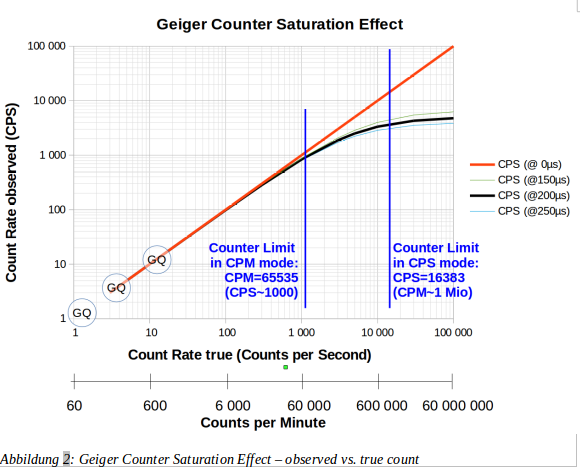 This algorithm is the only possibility for the 500+V2 to get closer to the advertised 42500 uSv/h of maximum dose rate that are in the specs (http://www.gqelectronicsllc.com/support/GMC_Selection_Guide.htm ). It will be able to measure 8000 uSv/h with good accuracy or even 32500 uSv/h if the HV PS can handle the SI-3BG at that count rate. Obviously, those dose rates are enormous and we can only guess what the tube�s behaviour would be. I cannot say anything else. Take your time to analyse the spreadsheet and it is your call to implement a good firmware algorithm to unleash the power of the 500+ V2, now that the hardware can keep the tubes in the flat top voltage region. I think it can be done easier than changing the tube voltage in the voltage percentage menu. I noticed that the counts of the tube 1 (in the �Large text� screen) go to 0 when you select only the �Tube 2� in the menu. That didn�t happen in the original 500+, so I assume that the firmware is automatically turning off the voltage of the tube not being selected by the user. I also confirm that if a tube is not turned on its voltage is a nominal couple of volts and not the percentage number in its tube voltage menu selection. @EmfDev: I found an odd behaviour in the calculation of the average CPM. It seems that you are dividing the total count over the result of rounding half up to the nearest integer the elapsed minutes (e.g. 1� 35�� = 2). That produces big jumps in the average CPM value, especially when the number of minutes is small or after resetting the total count with the corresponding menu option. Could you use the decimal conversion of the elapsed time in minutes? (e.g. 1� 35�� = 1.583). Using that number, the average CPM value would be smoothly calculated every second without jumps every minute. @ikerrg, we are still debating about that. Manipulating the cpm doesn't seem correct. expect the reading to always change every second (average = totalcount/(minute + second/60). Is that correct? @EmfDev: Well, you do not need to correct the CPM if you do not really want to mess with that, although it could be an advanced option disabled by default in the menu. But you can at least use the rest of the algorithm to avoid adding the CPMs of both tubes when in combined (auto) mode. That sum is also a weird manipulation! In the spreadsheet you can see the effect of both options, they are completely independent to be implemented (the dead time correction and the combined CPM calculation, I mean). About the average CPM, yes, that is exactly the calculation I would expect. It adds some minimal workload to the CPU every second, I suppose that would not be a problem. if they think that the measured dose rate is low in high radiation field. But that "calibration" is only for the CPM to uSv/h conversion, and that should be a constant, not a curve. And in any case, using only two points for the M4011 tube and 1 point for the SI-3BG does not allow for a nonlinear "calibration" dependent on the radiation level. 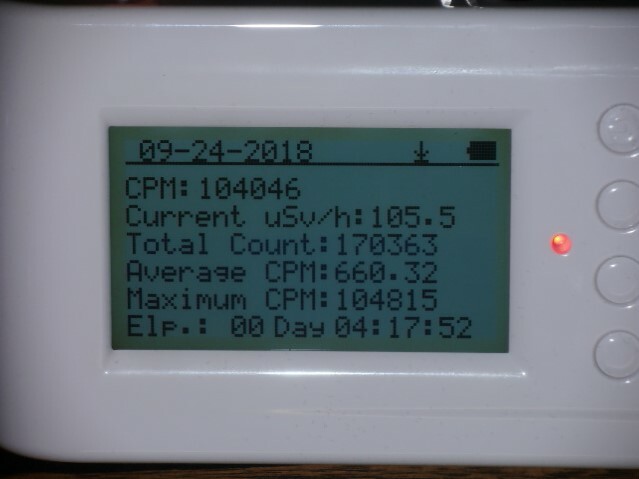 So users can calibrate their device for, lets say, 1000 CPM, to be equal to 6.5 uSv/h but the same calibration would not work at 100kCPM, as 650 uSv/h would not be the equivalent dose rate because the tube is behaving nonlinearly at high CPM values, and the real equivalent radiation would be 150kCPM = 975 uSv/h. That is not a calibration by definition and, in any case, it would be impossible to be defined with only 1 or 2 points for the curve as it is currently programmed in the 500+ (V1 and V2). - The energy of the radiation. ..and it is unmovable when the information above is known. Then the tube behaves nonlinearly, but that only affects the number of counts it reads which only depends on its recovery speed and the radiation intensity. The conversion to uSv/h would always be the "calibration" constant times the CPM! I measured the voltage directly with the 10MOhm multimeter @22% and it was 143V and 140 V. So either my multimeter does not have a precise 10 MOhm impedance (odd, because it is in the specs) or my 500+V2 has a voltage regulation much lower than Stargazer_40's. When I measured the old 500+ some time ago using the same voltimeter and 1 Gohm resistor I found very similar values to ullix's and everybody else, so my guess is that something is different in the HV PS of my 500+ V2. It might be the tolerance of the installed inductors/capacitors, no idea. It's the inductor ikerrg. One V2 I have gets to 450VDC at 22%. The other gets to 450VDC at 27%. So as long as you can achieve top of the plateau range then PS is working okay. That happens for both HV PS, the one for the M4011 and the one for the SI-3BG. Therefore, it would be related to both independent inductors. Do you expect that fitting the second inductor to the M4011 PS will change anything? Question for support@gqelectronicsllc.com I think. I don't know. And now just a bonus! This is a picture in the Natural History Museum of Geneva. See the minerals behind the GMC. Torbenite and Ianthinite. They were driving the counter at very high count rates, considering the distance (about 150 mm) and the thick walled glass between the counter and the minerals. 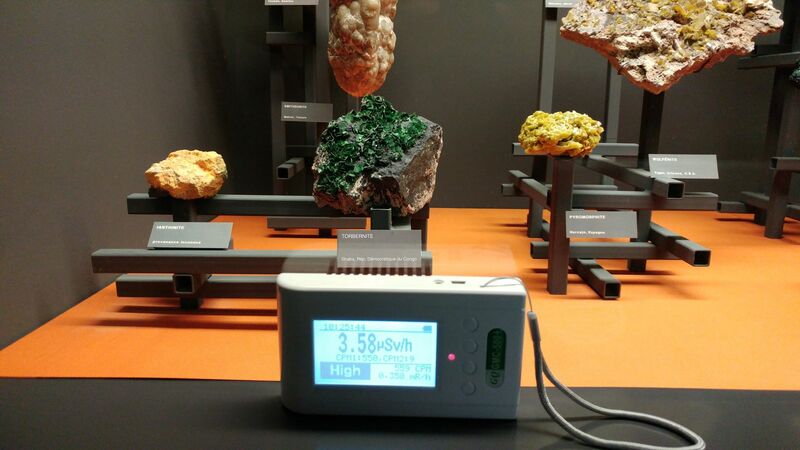 Nothing was said about the radiactivity in the area, it could be detected at quite long distance from the glass. And my guess is that it was mainly gamma, as I cannot imagine the betas going so far, and the SI-3BG tube was also very sensitive to it. I would have needed much longer times to get some statistics, but if you can find that amount of Torbenite you will probably be able to get a good source of gammas once the betas are filtered! Good picture. Thanks for sharing. Very nice ikerrg. Thanks. A lot of work went into designing and building those display stands. Art in itself. I hope the museum techs are careful when opening this case. Torbernite outgases radon gas (222Rn). Case should be evacuated before opening. Here it goes an additional piece of data. My last flight from Geneva to Heathrow measured with the 500+V2 and now only using the sensitive tube (M4011). When passing through the x-rays, it peaked at 3581 CPS, with a total of 7025 counts in 5 seconds. This time, the M4011 tube did not look saturated, but the x-ray machine was different and the voltage in my 500+V2 was much higher than when I did the same in Heathrow last summer. I am starting to think that the Heathrow x-ray machines are much more powerful than in other airports! I need more trips and measurements to confirm this. The Poisson distribution looks about right, considering that the cosmic radiation is not homogeneous at all. By the way, @EmfDev, the parsed data from the DataViewer software is totally wrong again! I did the parsing with GeigerLog and it worked perfectly. Thanks ullix for such a great tool! What kind of supersonic aircraft were you boarding in Geneva? The graph shows a flight time from 1700h to 1800h, i.e. 1 hour straight from start to landing. The typical duration for that route of some 760km is 1h30min or even 2h? The clock in the 500+ is working correctly? Re the Poisson Plot: It is applicable only for a constant radioactive source, which must not be moved relative to the counter for the duration of the measurement. When the source's intensity changes, like during a flight, it will become an overlapping set of an infinite number of Poisson distributions. A "good" or "bad" Poisson fit then has no meaning. But, of course, it might still be a tool usable to verify that nothing unexpected has happened. Try the FFT on the profile; you should at least see the 1h period being dominant. We were delayed and the pilot said that he would try to recover the lost time by going a bit faster. And you have to consider that the radiation increases sharply above some altitude, so the flight might well be from 16:50 to 18:15 or more, and that is 1h 25 minutes. 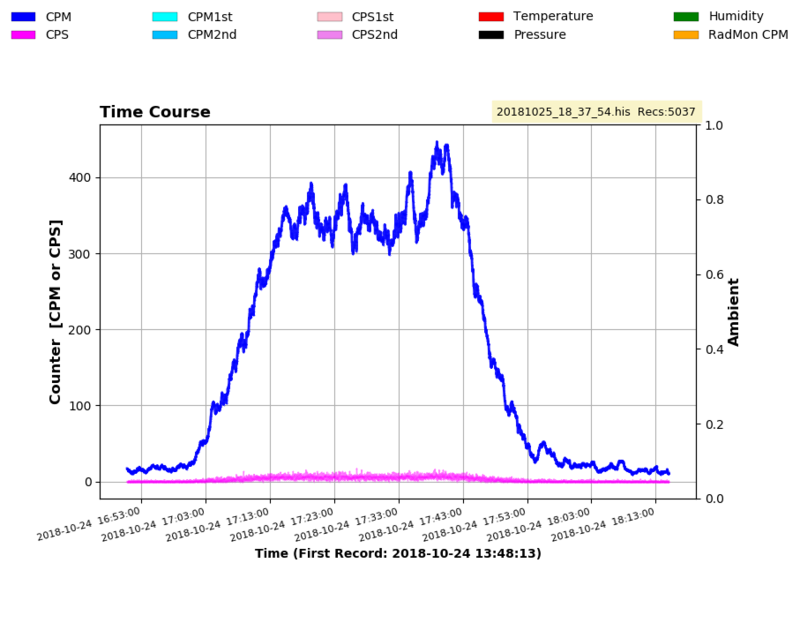 I actually saw just a little above ground background radiation when we were still at 3000 m.
Re the Poisson, I did it only of the flat top, about from 17:13 to 17:33. Even with that, I suppose the cosmic radiation cannot be considered constant. First, you seem to assume a non-linear increase of cosmic radiation with altitude, because you mention very little increase up to 3000m. Second, the "alpine" profile at cruising altitude looks like being well beyond any Poissonian fluctuation. I suspect the flight went up and down to stay in some assigned flight corridors? Would be great if next time you could register time of takeoff and landing, as well as altitude over time? It is difficult to keep a record of the altitude, as the information on the LCD screens is only showed some time after take off and until some time before landing, as the screens are retracted for take off and landing. I did that last time the best way I could, but it is quite time consuming and this time I had to work during the flight. The flight was scheduled to depart at 17:30 (Geneva time, so 16:30 in counter time), but as there was a delay (I cannot say, but it was around 15 minutes), we might have taken off at 16:45 or 16:50, not sure. I did my last phone call at 16:35 from inside the aircraft before starting the taxi to the runway. Regarding the landing, I do not have any phone call or SMS to check the time, but it was before 18:20 for sure. In anticipation of the dead time correction addition to firmware I have been looking more closely at the comparison of M4011 tube performance against the SI3BG. I am more convinced than before that the SI3BG GM tube is a very nice compliment to the M4011 GM tube (as far as Cold War GM tubes go). Receipt of higher activity Cs137 source has allowed both tubes to be effectively employed and shed some light on dead time correction, but will be better comparison once firmware does the work. In rough numbers, the 184,000 CPM has a corrected for dead time CPM of ~217,000CPM. In order for the SI3BG tube (with a dead time correction at 1,600CPM of only +9CPM) to match the corrected CPM of the M4011 tube at conversion to uSv/h (.0065) the SI3BG tube's conversion needed to be at 1.13CPM/uSv/h (.885). I had initially wanted to use .797 as the average of high and low given in specs, but in fitting the data I found lower end was better. The other significant change was I needed to lower the dead time of the M4011 tube to 50usec. ullix showed that dead time is somewhat insensitive adjustment, except at very high counts, and we really don't know yet what the actual dt of the M4011 is, so all is good in my opinion until we are comparing the two with working firmware to adjust the calibration with both conversion factor and tube dead time. That the dead time correction for the SI3BG is inconsequential at 1600CPM makes this pretty straight forward. What my expectation is after this comparison, is that the dead time is going to be just one of the factors involved in getting the best calibration of the meter (both tubes to agree). It remains an important add, but we are going to find that once implemented the best numbers for conversion of both tubes and dead time for the M4011 tube will be essentially standardized, and for the out of the box performance of the meters we can say with some certainty that we are adequately incorporating the correction. The dead time of the SI3BG was estimated at 200usec for this test, but I don't think I'd worry much about that. Further work here will wait till firmware is done. Then with three M4011 tubes and four SI3BG tubes in stock to get better averages I will go through this all again to see if I can come up with a better estimate of parameters for conversion and dead time in general. I also want to look at these numbers with shielded sources for gamma only. The mixed energy levels of betas and gammas are certainly affecting the numbers and the gamma response is what's in the specs. @GQ, any update of timing on when this will be ready? I also want to look at these numbers with shielded sources for gamma only. The mixed energy levels of betas and gammas are certainly affecting the numbers and the gamma response is what's in the specs. I was just going to start writing before I finished reading your full post, but your last sentence is exactly what I was going to say. In order to compare both tubes, we need to use only one type of radiation, because both are quite different in their response to betas and gammas. And the best are gammas because it is not possible to shield at once the gammas and not the betas. The conversion to uSv/h is irrelevant for this comparison, it only adds confusion. We need that the firmware can be flexible enough so the users can calibrate their counters for a given type of radiation and source, but we cannot expect to set perfect default values valid for any kind of radiation out of the box (just to use something sensible). 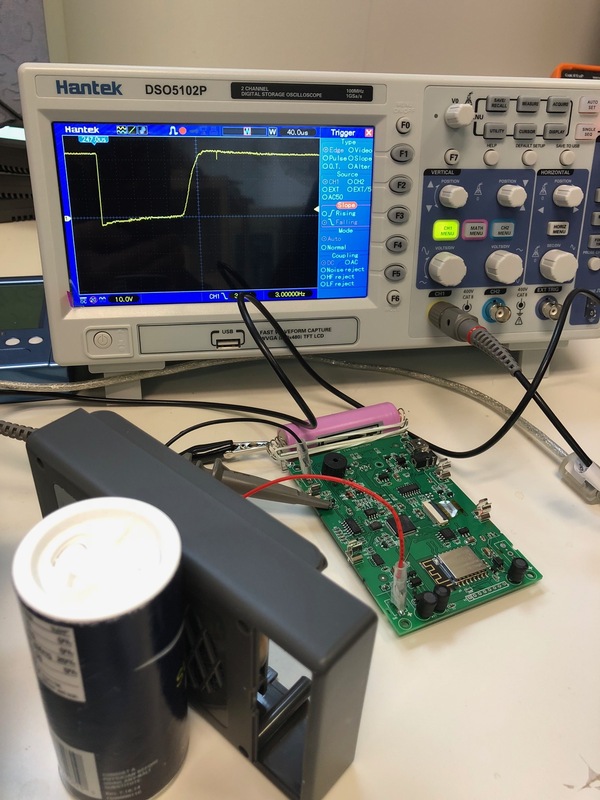 The most we can ask to GQ from their product is that the counter firmware can use a dead time correction and a uSv/h to CPM ratio specified by the user, and that the hardware can keep the voltage of the GM tube inside the plateau even at high count rates. We almost have everything already! With all that, it is up to the user how to use the counters in the best possible way. You guys can ask support for the dead time/fast estimate update if it's ready. But it doesn't have the ability to change normal/medium/high yet. Is that for 500+V1, V2 and 600 and 600+? @EmfDev: Do you know if the update is also applicable to the 500+ V1? Oh it should be available for V1/V2 500/+. Let me know if it works so I can port it to 600. 600 not ready yet I think. You guys are great. This is like new present every other week. Although it is important to say that light is at end of tunnel for these meters. I think that when these items are taken care of the only other thing that is really exciting to me (besides some minor things) is auto voltage regulation. Can't wait to see how we're going to accomplish that! Idem. Thanks for your support! For the auto voltage regulation, we are still looking into it. Need to consider if we need another hardware revision. I contacted support yesterday but they didn't send me the link with the firmware update. @ Stargazer_40, did you get your firmware updates? They might need more time to be sure that they are working as expected. About the auto voltage regulation, that would be great, but we are now in a position to determine if it is actually needed. I suppose that Stargazer_40 can drive the M4011 tube at 200 kCPM (maybe more) using two calibrated sources and measure the voltage drop in the HV PS circuit (e.g. when starting at the maximum of 450 V at 0 counts). I think he did that at a lower count rate of about 100 kCPM. If the HV PS can support 200 kCPM in the M4011, I do not think that the M4011 tube should be used for more than that count rate, and there is where the SI-3BG starts to be really useful in the GMC-500+V2 featuring two independent HV PS. I also requested firmware for my counters, but since we're updating a number of devices, I think they're likely making sure they are ready to go. Haven't got anything yet. Monday's are busy days so likely it will take a bit. I've gotten over 180kCPM with the M4011, and you bring up an excellent point in that the device was always meant to switch over to the SI3BG for more intensity (and that was at only 30,000CPM). There will be a lot to look at with the dead time correction added in. Trying to build a little matrix of flow to evaluate. Really need to get a better idea of GM tube performance variation between samples. Auto voltage regulation is important because we're trying to avoid plateau slope effects. Not too bad for the M4011, but quite steep for SI3BG (.25%/V) and even more for the SBT-11 in the GMC-600 (.50%/V). Would be best to keep at recommended working voltage through auto regulation. Good point, I did not remember the sensitivity to the voltage for the SI-3BG. So you can loose a good percent of relative accuracy just due to the 0.25%/V slope. In any case, the auto voltage regulation might bring other problems, like more design complexity and the reaction time to voltage changes (not a quasistatic DC bus anymore? ), that may have to be considered in the design process. But it seems something definitely worth looking to achieve the definitive accuracy level, but not before the dead time correction has been confirmed and tested in different scenarios (step by step changes). Yes, just give them time. Maybe they're very busy. For voltage adjustment, it's always gonna be 1 second later than CPS. So it can be dangerous to the tube. We need more information and testing for this feature if it's possible. If risk > benefit, then no need to add it. Two things affect the auto voltage regulation. The first is the natural voltage limit of the power supply. You may recall from my comparison of the percentage number to the voltage measured in Reply #8 above that the power supply in the 500+ is limited to about 600VDC. Even if the number is at 100% it approaches this limit. So we aren't going to see 1000VDC. @ZLM said I think that the inductance controls the voltage, and that higher voltage decreases current. So for any GM tube type we could limit the power supply max voltage by choice of inductor. This alone may solve the problem of possible tube damage. The second thing is use. As a personal dosimeter we are not quickly seeing a changing field where one second will make a large voltage change up or down. When used as a 'frisker' detector though the possibility of spike is higher. Simple directions for use of turning off auto voltage when frisking would provide ability to get good utility of use without potential for spiking. If something looks hot, shift to auto voltage regulation (and already likely in Fast Estimate mode) and take timed measure of sample. This might get too complicated for some users to deal with, but I think those using the meter as a serious tool would take the time and make the effort to use it appropriately. What about this, when the unit detects > 1000 cps for 3-5 seconds consecutively, we increase the voltage to about 2-3% every 1000 cps. And as soon as the current cps becomes < 1000, we just turn it off instantly. @EmfDef, 1000cps is 60,000CPM. I think at that point we are already down 6% (down ~10VDC per 1% and 1% for each 10,000CPM). So perhaps better to go 500cps per 3%. Smaller steps. Are we able to step down as well as step up? I almost want to use one of the buttons for instant on auto voltage regulation. When pressed and held turns on auto voltage regulation for accurate sample measurement, and then when released it goes back into what was originally set. But for now just being able to turn on under User Options, perhaps at first selection, would be great. Yes it can step down, because it depends on the last 3-5 seconds cps. We can then try every 500cps(can change) we increase it by 3%(can change), and as long at the latest cps < 500, it drops down to 0% increase. This one can still be improved. Not possible to hold a button because the cpu polls and waits until a button is released or after certain time, then goes back to polling again, but it can detect when you hold it for 1-2 seconds then you can release (similar to the spectrum zoom out in the EMF380 meter). But this advanced feature isn't that useful/normal for typical customers. The user options/tube settings should be a better place to put it. Any news about the firmware update with the dead time correction? You'll be receiving it soon guys. OK, do not rush, test it thoroughly before release. It is just that we are keen to test the biggest and the most relevant change in the firmware ever! We just found that the 600+ LND 7317 dead time is on average about 240 microseconds. These are for the 500/+ tubes. Very interesting indeed! I have been trying to reach tech support at LND to talk about their tubes and dead time and still waiting for call back. What about the SBT-11/11A? The SI3BG probably isn't all that important. If the tube ever gets to the point where dead time is important for conversion, no one would want to be there to witness. That is awesome! So the M4011 is actually a quick tube, and that number matches perfectly to what we guessed from user06 measurements. Regarding the SI-3BG, even if it does not matter too much, the evidence is the evidence! Great tube to measure extremely high radiation. I wonder if that short dead time will be the same in higher fields. What source did you use to measure the SI-3BG? Was it just a background event? @ikerrg, you are certainly right. The dead time correction down at 30usec takes us comfortably past 50 R/hr with the SI3BG (20-25% add to CPM). First Responder turn around point is between 35-55 R/hr (300-500mSv/h). Mild Radiation Sickness occurs at roughly 3.5-4 times that upper limit (1,750mSv/h). No other personal dosimeter gets anywhere close to being able to take readings at that level. Makes the 500+ absolutely unique in its applicability. This one is for the SBT-11 tube. It's around 180-200 uS. @ikerrg, for the SI-3BG, we used the smoke detector/gamma to help produce a count. @EmfDef, what two points on the board are you taking measurements from? Tube 1, is from ground and the collector of transistor V3. And ground to collector of transistor V4 for tube 2.
the dead time becomes narrower or shorter (66 micro seconds with ~350V) compared to the 120 uS with around 400V. drops really low? We'll need more testing for this one. @EmfDev: That is an interesting finding! And it makes sense. The avalanche event takes longer to extinguish when the voltage is higher, basically because the amount of charge flowing (current) is also larger. But it is good news, as the short dead time is only needed when the CPM is high, which for the present HV PS (not auto regulated) corresponds to when the voltage is smaller in the tubes. All these effects are difficult to take into account accurately in the firmware (a full characterization of each manufactured tube would be required). 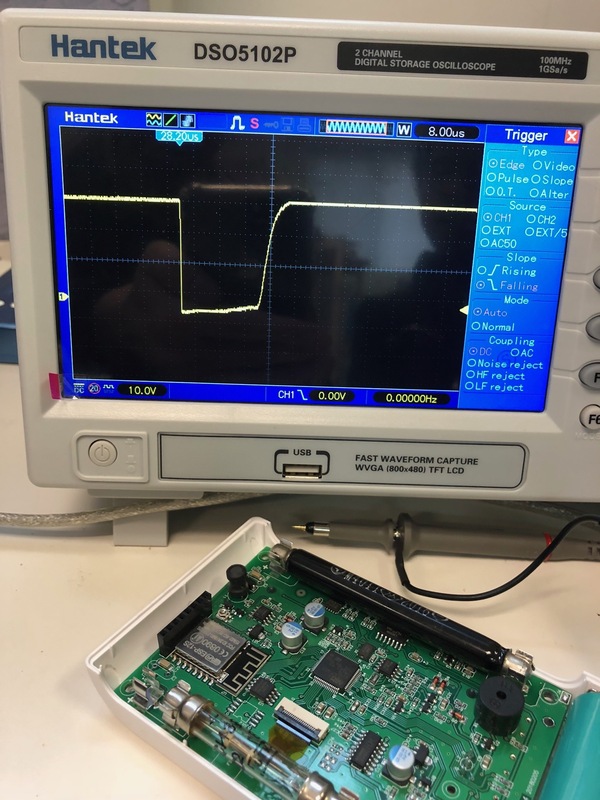 The firmware will need to store a voltage vs. dead time curve + be able to read the PS voltage to set the correct dead time correction at each voltage. Alternatively (and I think this is the best thing to do), the PS could just keep the voltage at the same value just at the low end of the plateau (350 V for the M4011), resulting in the shortest dead time (constant) and a longer life time for the tube. This is easier, but it will require a new hardware revision to control the voltage of the PS. But it is a win win situation, because it will remove also the dependence on the working point in the slope of the plateau, so the sensitivity of the tube will be constant at any CPM or radiation level. So, in summary, with the addition of the dead time correction to the firmware (only a single constant dead time), if you also add later a voltage control system to keep the voltage steady at any count rate (obviously up to a maximum defined threshold), you will have a measurement accuracy unrivalled in any consumer device. The GM counters could be even certified by calibration laboratories! My oscilloscope is a bit dated, but the functionality is there. Testing the M4011 with voltage set at 450VDC with 1G probe in series and gas mantles. Connections are (-) battery clip and anode clip (after anode resistor). Here is a shot of the screen (I will get better at this) with vertical .5VDC and horizontal 50usec per large division. I can see recovery, but aside from voltage settling only the quicker settling between tubes is indicative of smaller deadtimes. And here is SI3BG with 50usec. Faster recovery from power supply response. Next I did the SBT-11A at 450VDC. Here is 100usec per major division. With mantles. I tried to measure the LND-712 that I adapted to the 500+V1. It has a 10Mohm anode resistor in the wand and the LND-712 is glued to the tube so can't get at it to get past it to just the anode. I could see very small voltage drops at the meter connection to the wand cable, but couldn't get low enough trigger to get pulse locked in on the display. I'll put in 0-5% increase every 500 in last 3 CPS and I'll let you guys test/decide only if you want to. I think it's important to test both of these utilities. I have already forwards serials for updates. Please include auto voltage and dead time correction. I have been attempting to contact LND and chat with their sales tech guy. Turns out he is the owner and so far has not been available. Will keep trying but so far, nada. I don't believe that it is sufficient for the voltage drop to return to the level prior to the particle caused avalanche for determination of dead time. 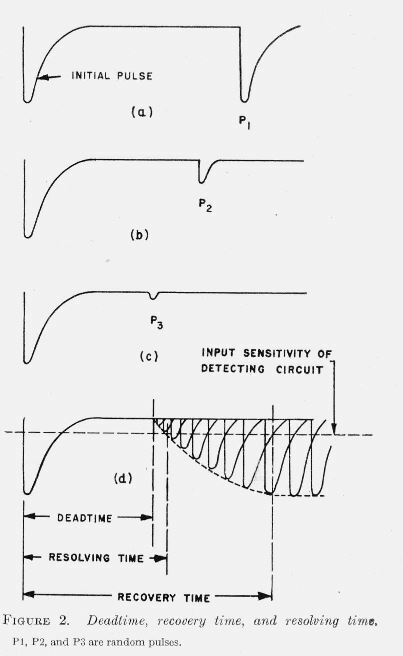 This paper from 1949 discusses further delay while positive particles redistribute within the GM tube. It is not simply a function of power supply's ability to support with enough current. The GM tube won't be fully ready till Recovery Time complete, but probably will generate a pulse at Resolving Time. @GQ, what does your measure at the Collector of the transistor actually mean? It doesn't look like the pulses we've seen so far. Look into my measurements shown here http://www.gqelectronicsllc.com/forum/topic.asp?TOPIC_ID=4598 under Reply #14.You see dual traces of anode signal and audio signal. The bottom 2 pics are most relevant. You see that @100�s there is no audio signal, while @150�s there is. Now, this is using the audio signal as a proxy for a "good" count, which needs to be proven to be true. With this and other measurements I concluded back then that the "deadtime" - you now call it "resolve time" - was 200�s. This time would be used for the "deadtime-correction" with the formula I gave. For new measurements I'd suggest to use channel 1 at the cathode (not anode, because the counter uses cathode sensing), and make this the trigger signal, and use channel 2 at the interrupt pin of the microprocessor, which is used for counting. And then use a high-count source and restart single osci shots until you have some where 2 pulses come in close enough succession from 50�s ... 500�s. Is a bit cumbersome but possible. @ullix, I had read through that entire thread before. Amazing to me the capability of modern oscilloscopes. In the 1970's I built two Heathkit oscilloscopes. They were quite capable and one was a dual trace. Long gone now and I picked up this Heath from an estate sale years ago when buying some ham radios. To see the little, almost smartphone-like scope with what it can do and the Hantek that GQ is using and what they seem to be able to do so effortlessly, so very cool. So the real question is what the counter actually counts. Some threshold needs to be counted and you're saying if there is an audio tic indicating that the counter is counting and close enough together gets you dead time. I think in the diagram above we're talking about the Resolving time and not the Recovery time. When the pulse falls below the detection limit it will generate a count. I am still interested in GQ's measure because it is more black and white/on and off. And on the graph above, what appears to not be very sensitive effect dead time-wise is also plotted on semi log graph. When we are talking about what upper-end effects of deadtime limiting tube response and get to the infinity point and turn negative from calculation we can estimate simply from actual response with high enough activity source. We are almost seeing that with the very sensitive 7317 and SBT-11A tubes now. Power supply issues appear to be behind us and we are actually seeing that we can just get so much out of some of these tubes before they will go no higher. It is at those measures that the dead time correction is especially important. The article I posted link to is dated 1949. Definitions likely have evolved and dead time may now include through end of Recovery period. It isn't described that way though in any web search result. And people I've chatted with call the later effect 'latency'. Still, just because voltage is increasing to what it was before pulse, doesn't mean the tube is ready to indicate pulse again. That is gyst of point I was making, so my plots above are pretty worthless unless as you say multiple pulses come in close together. My scope isn't a storage scope. All I see is a bunch of overlain pulses from common trigger point (very active sources for tube tested). I'll look at English varient of the scope you referenced. And the one GQ is using. Thanks for thoughts. @Stargazer 40, the mini scopes are really amazing. inclined to buy here in Japan one of these to replace the sound input ports of my PC ;). Actually like the upgrade to SainSmart(same scope with slightly different name in US) 212 with the touch screen. Get the armored rubber case and stand and I REALLY like the little micro BNC connectors. $110USD and $13USD for the case. Would use existing probes with converters from BNC to micro BNC.